Lindsay Knowles, a former student of Canberra High School, died in action during the Second World War. This award for citizenship has been established by his family in his memory. Australian Defence Force Long Tan Award. This programme has been created to acknowledge the achievements of young people who have demonstrated outstanding qualities of leadership and teamwork either within our school or the wider community. The Catholic University Award is awarded to the student who demonstrates outstanding commitment to their studies and involvement in the School Community. The Kylie Souter Award recognises a male or female student who has shown determination to achieve, to give and to work as part of a team. This award is donated by Brian Lamont and the Souter family. Cheryl Ujdur was a student at this school in 1987 who unfortunately passed away during a school activity. Cheri was a confident, strong willed and free spirited young woman who more often went with what she felt in her heart rather than what she was thinking. It was these attributes that led her to achieve a high standard at creative writing. This award is a memorial to her and given to a student who excels at creative writing. 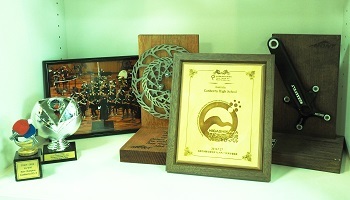 This award is donated by the Ujdur family. E. G. Evans was the Principal of Canberra High School from 1960 to 1970. This award recognises a male and a female student who are excelling academically as well as demonstrating leadership and success in the sporting arena. The Burmester Award is awarded to a female student for citizenship.This award is donated by the Burmester family. Sue and Geoff Young taught at Canberra High School for a combined total of 40 years. This award is for a student who has worked hard, especially in years 9 and 10, for the school community and at his/her studies but has not been recognised with any other award. This award is donated by Sue and Geoff Young. The Parents and Citizen’s Award recognises the contribution a student has made to the community, working in his/her own time for the good of other. 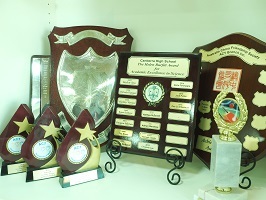 The CHS School Board All Rounder Award provides and award to acknowledge a student who is effectively involved in all facets of school life. Helen Burfitt was appointed Principal of Canberra High School in 1991 and retired in 2003 after 34 years of teaching in Canberra. As Principal of the very best high School in Canberra, she promoted a school that was proud of its students and staff, proud of its traditions and proud of its reputation in the community. This prize is awarded to the student who is most proficient in Science. This award is donated by Helen Burfitt. The Sports Blues are awarded to students who demonstrate excellence in sport, outstanding sportsmanship and leadership on the playing field, represent our school in a nominated sport. The merit medal is presented to students who consistently uphold the C.A.R.E.S values.